My friend JR gave me a Yeti cooler like the one you see here and I loved it. It was subsequently ripped off much to my chagrin. So I got another one and decorated it and it is one of my prize possessions. I fill it with ice every day and drink a lot of cold, refreshing water for many reasons. My original blood clot in my calf was the result of a crash on my road bike in Ireland and a long plane ride home. Dehydration also played a part and I have been dealing with the results of a DVT and a Pulmonary Embolism ever since. Don’t get me wrong, I am fine. I can ski, run,ride a bike, etc. But I wear a compression sock when I am at my desk or on a plane because my calf swells and I take Coumadin with no effects other than keep my INR in check. But no residual effects of the embolism these 30 years later. Had I taken the time to drink more water, I may have never had any of these things happen to me. You may never think of it, but in the winter, you need as much water as you do in the summer. At the ski areas out west, there are water coolers everywhere and I always take advantage drinking lots of water at altitude. The first day, I tend to get a headache due to the altitude adjustment but drinking lots of water takes that away and all is well. 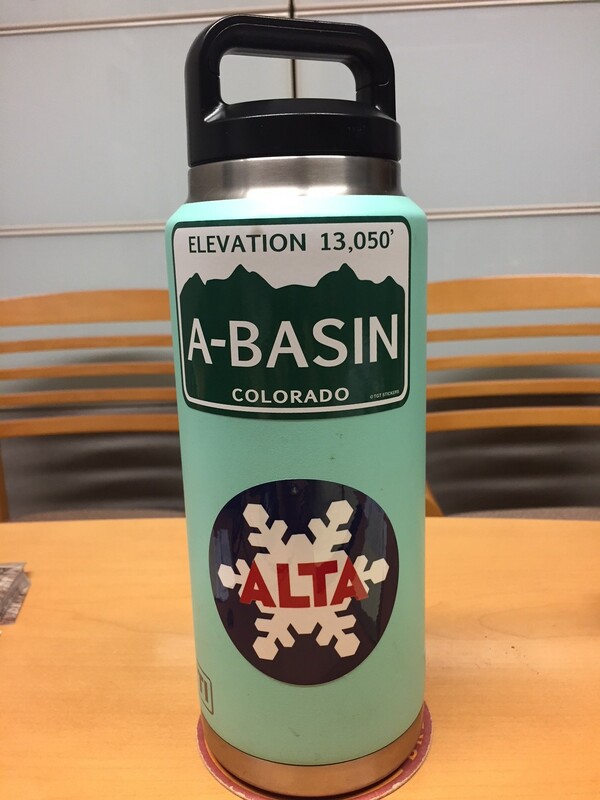 It tends to be dry out west and in the summer and winter, it is important to hydrate. Not to dwell on TMI here but I have also had the unfortunate experience of having a kidney stone. Another result of not drinking enough and salts and calcium build up in the kidneys. Maybe one of the most painful experiences of my life and another reason I live with the Yeti cooler at all times. Nothing is more refreshing after a mountain bike ride than to sit down in my soccer chair and bring out the cooler of ice cold water. I sit there,re-hydrate, and take a breather. Which brings me to the real subject of this post. After 274 posts, 4 years after my wife suggested to me that I write a blog to get all of my stories in my head published,( I also have 2 volumes that I had made into coffee table books), I am going to take a break. I am again out of gas and need to put the Chronicles on hold for a while. It has been a lot of fun but it is time. I may pick it up again sometime, as it is only a hobby. I have appreciated all the nice comments and not so nice comments. It is nice to see that people have followed the blog and have enjoyed it. My only vision beyond chronicling my adventures and thoughts for my son Jack to read with grandchildren some day down the road, is to encourage people to do things that they might not ordinarily do. As you age, it is important to stay active. Never let people tell you that you are too old to do anything. Try new things. Engage with new friends. Be positive and enjoy what life has to offer. Some people my age come home from work and get a hot bath and watch Fox News all night. What kind of a life is that? 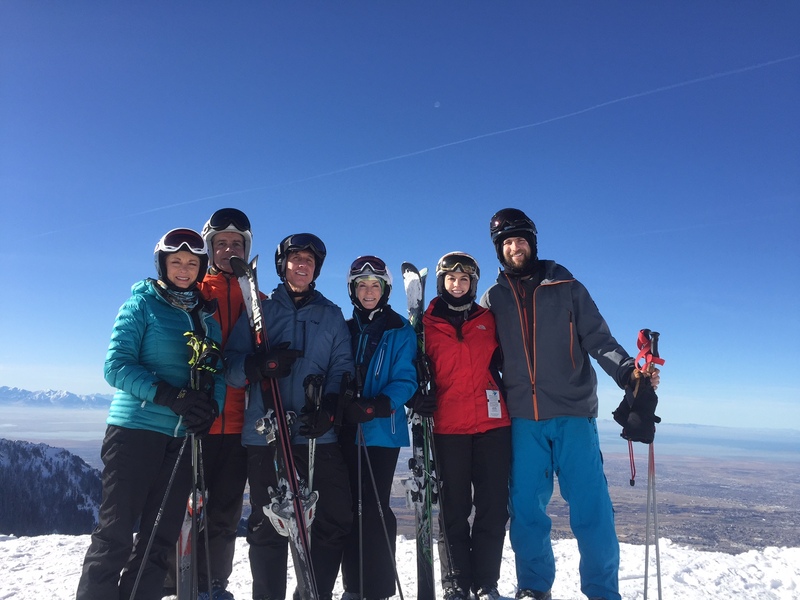 It is great to be with people of all ages and I find it especially rewarding to be in the company of younger people while skiing, or riding and hearing what they have to say about the world from a younger perspective. Like drinking water from that Yeti, their ideas are refreshing. So in the mean time, try new things, be kind, be positive, and take that pause that refreshes after a wonderful day in the world. Thanks so much for reading. Self deprecation has always been one of my strong suits. An Irish trait really. I have attempted some new ventures with humorous results and like Dirty Harry Callaghan says,” A man has to know his limitations”. 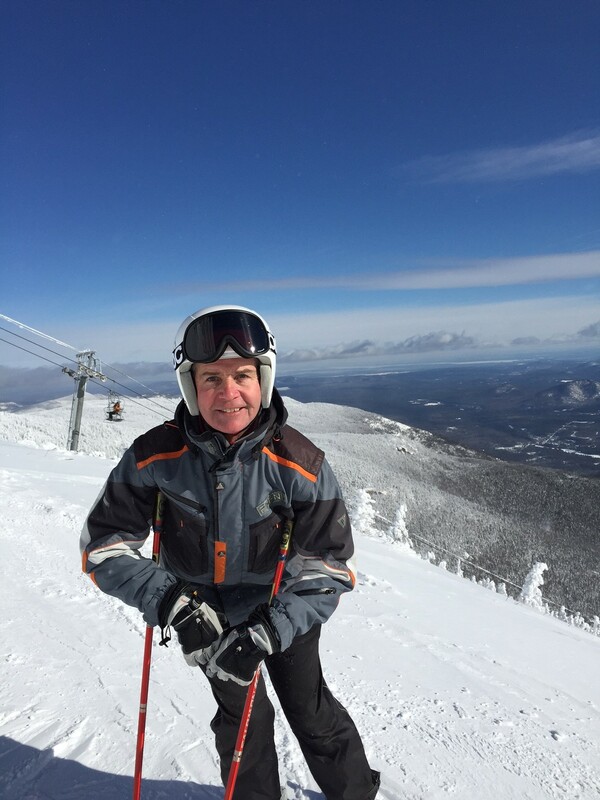 Now I am pretty comfortable on a pair of skis and can ride a mountain bike fairly efficiently, but have not had success in some other ventures over the years….. like golf. 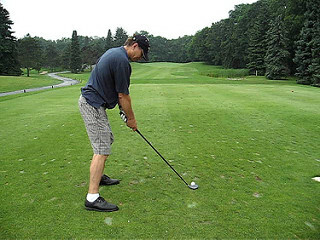 A golf club in my hand never had a natural feel-kind of like a telephone pole, and when I would manage to par 3 or 4 holes and then launch a tee shot into an adjacent house near the golf course, I knew that my feel for the game was lacking. I was a good caddie back in the day. I understood the game and even caddied for Ben Crenshaw at the Open Qualifier at Shannopin Country Club in Pittsburgh when he was a student at the University of Texas. But when it came time for me to actually play the game, I really had no feel and was too nervous and jerky for golf. Fast forward and I found myself in recent years playing in scrambles tournaments to benefit Ronald McDonald House Charities. Scrambles were fun in that you could just bang one off the tee and if it was not good, all you had to do was put your ball where the best tee shot was in your foursome and go from there. No pressure at all. But when I had to play my own ball at a place like Laurel Valley in Ligonier, I was exhausted and shattered after 15 holes due to many swings, lost balls, and generally a course that was way above my ability level. I have since given up the game and politely refused any further invitations. I always felt intimidated by that little ball staring at me on the tee and the possible errant trajectories that it could take after one of my swings. I am fairly athletic- but golf? No feel at all. Then there was the time that I thought it would be cool to try kayaking. I took an adult continuing education class at the University of Pittsburgh with a lot of instruction rolling the kayak in a swimming pool. Another example of not having a feel for the sport. I always felt like I was going to roll the thing over anyway and was never seated comfortably in a kayak. Then came our final exam up at the Youghiogheny River. I had a rain suit on which was useless seeing how many times I tipped the kayak and to add insult to injury it was snow showering during the event. 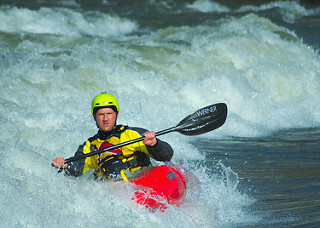 I eventually dragged my sogging body down river and unloaded the kayak never to attempt the sport again. I missed being a river rat at Ohiopyle because I thought I would have a home there with all the other pine cone eaters but it was not to be. I did take my wife and the in-laws white water rafting one time at Ohiopyle, but the result was basically the same with me flipping out of the raft at Dimple Rock and laying on my back in the Swimmers Rapids and floating behind much to the consternation of my wife and mother in law. They did’t realize I was out of the rear steering position until I passed them floating on my back. See you in a mile dear!!! I was a “B” tennis player in my day with a self taught ” whirly bird” service motion that people found quite humorous. In one tournament, the opponent started laughing because he thought I was kidding. I said, ” No man, that is my real serve.” He laughed again and killed me in the tournament. I eventually gave up tennis for running and did that for quite a few years until I took up cycling which I still do today. So, after several failed attempts at other things for variety, skiing and cycling have been my mainstay activities for years and at this point, I am not interested in trying anything else. 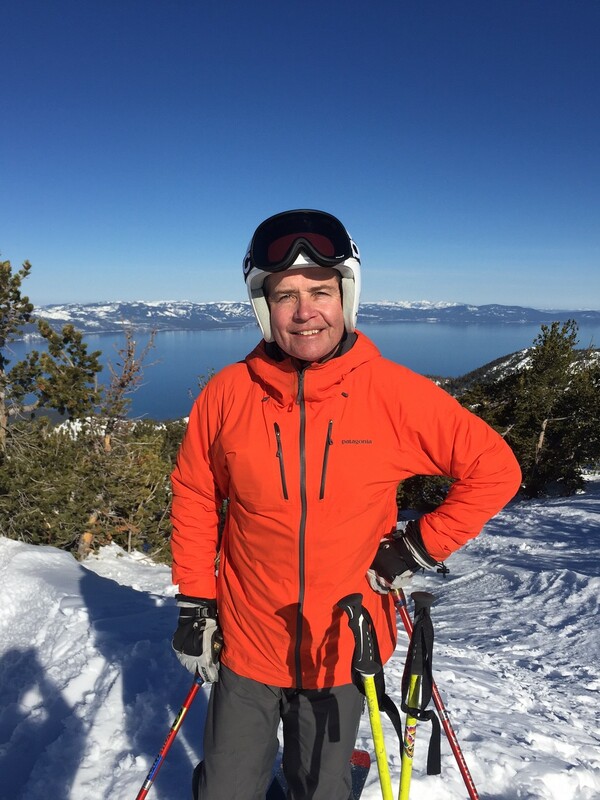 I am often asked if I ever tried snowboarding or telemark skiing. I really have no interest seeing that I really like to alpine ski. Been doing it for 57 years so why deviate? Also, mountain biking has basically taken over my cycling world because I am a bit concerned about violent drivers and drivers who do not pay attention while texting. Road cycling is starting to get a bit sketchy for me. Riding in the woods is pleasant and no irate drivers throwing chipped ham sandwiches at me and yelling at me to get off the road. True story. Had mayonnaise on it too. One last activity that has come and gone for me is fishing. I used to go with my grandfather a lot and had some outings with my family where we caught a fair amount of baby sharks. 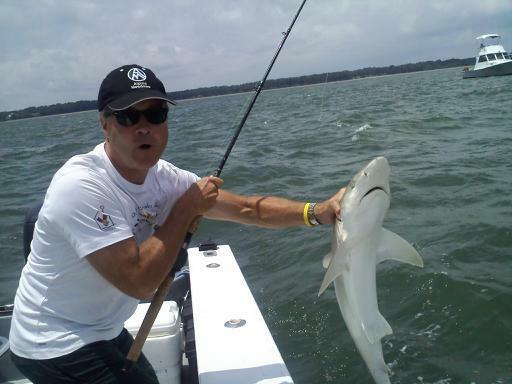 But for the most part, I am unlucky in the angling department and it came to a head years ago with unsuccessful attempts landing a fish at the ocean, I took to desperate measures. I went to Piggly Wiggly and bought a whole Red Snapper and put it on a hook and threw it into the ocean trying to please my son when he came down to the beach to see if I finally caught something. When I hauled it in, it was full of seaweed and my son said,” Dad- it looks dead.” I looked at my friend who came down too and I whispered,” Piggly Wiggly” He fell down laughing and that basically ended my fishing career. So I figure- just stick with what you know and at this point I am satisfied with my activities that will take me into old age. Ski to live and ride to ride another day. Thanks for reading. Now I know in this day and age with GPS and technology that allows one to navigate from the seat of a mountain bike on any trail in the world, a map might seem archaic at best. Not for me. Being a little bit of a curmudgeon, I still depend on maps in my pack to get a good read on where to ride. Case in point are the Purple Lizard Maps which are available at http://www.purplelizard.com These maps are water proof, tear proof, peanut butter proof, beer proof, and generally a good way to get around. 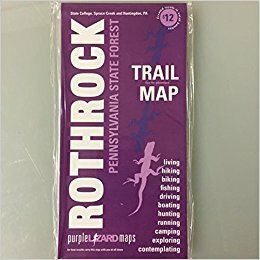 I just ordered my current version after using one for the last 20 years up in Rothrock State Forest near State College, Pa. These maps are great …….if you know how to use them. 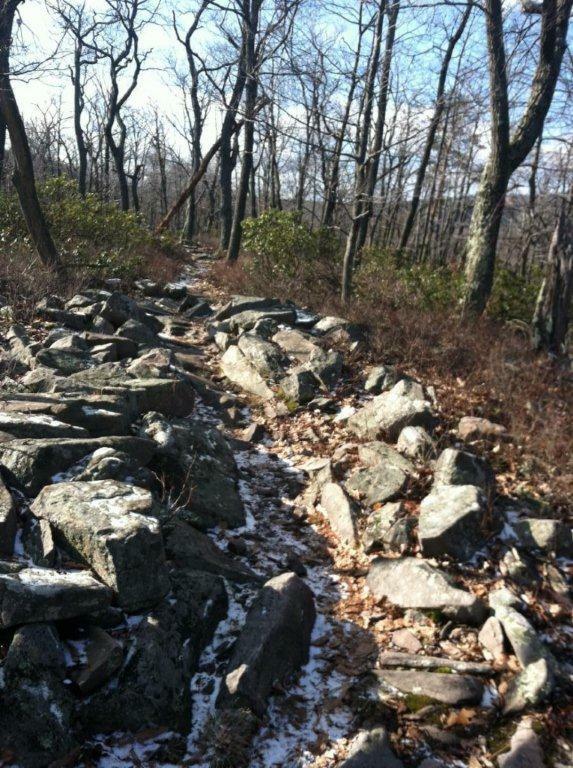 Like, read the trails and fire roads correctly instead of taking the wrong one and ending up 25 miles from my starting point at Tussey Mountain. I got hopelessly lost after mis reading the map. It was getting dark, I was already an hour late to meet my wife and her room mate from college. I was out of water, my cell phone did not work, and my Cliff Bar situation was getting bleak with a fuzzball caked piece left. I pretty much figured I might be spending the night because I didn’t have a light either. 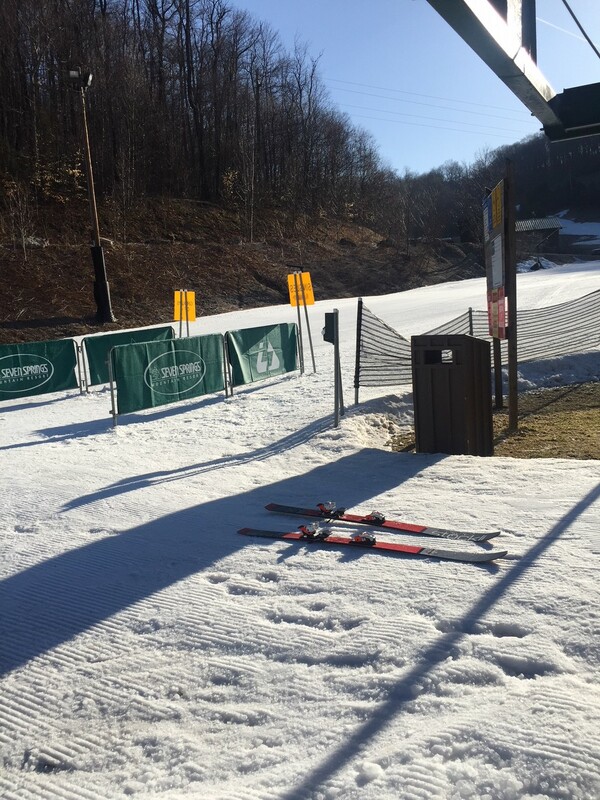 There is a sign on the chairlift stanchions at Whiteface, New York, and Killington, Vermont that says,” Don’t ski alone. These mountains are as desolate and remote as they were 200 years ago.” So is the backside of Tussey and I thought of those signs as I was starting to get concerned about my lack of navigational skills. Fortunately, I met up with a couple camping near Greenwood Furnace who offered to take me and my bike back in their pickup truck to Tussey. They were the only people I had seen for hours. Had they not been there, I would definitely have spent the night up against some tree. Not that I could not do that, but my wife would have been out of her mind with concern. As it turned out, by the time I came back to the Ritchey house where my wife and her room mate Kathy were waiting, I heard an ear full and knew that I needed to study the maps a little more closely. After all these years riding there, I am pretty familiar with the area now and the map is more of an insurance policy than anything. 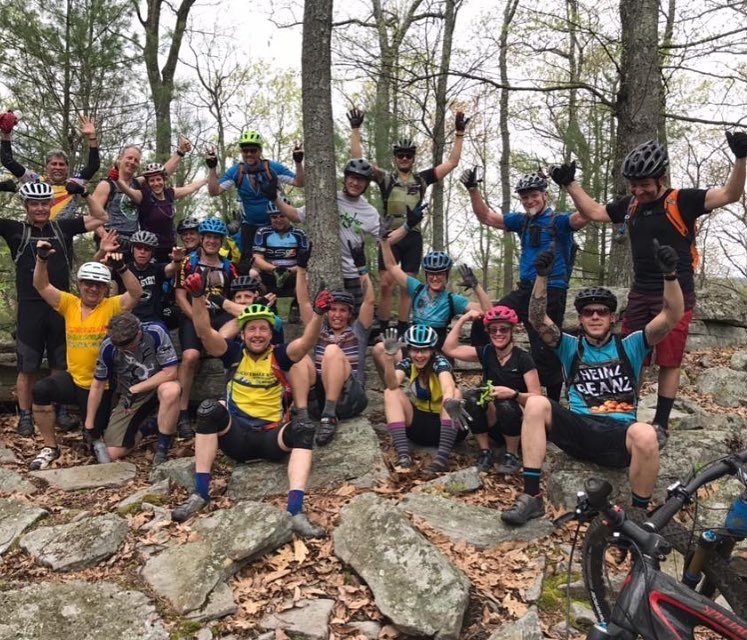 But I am glad I got the current version to use on my upcoming trip there to do the Coopers Gap Epic with a bunch of great mountain biking friends. I will tell you that I do a lot of adventurous things, but getting lost is a bit unnerving especially when you are running out of food, water, and light. Take the time I was mountain biking up in Ellicottville, New York riding away from the Race Loop Trail at Holiday Valley and into the Allegheny National Forest. I had a map of the area, although a bit outdated again, and I zigged when I should have zagged and voila, I ended up lost again- no water, sparse energy bar supply, and no lights. However I had cell service and called my friends at Mud, Sweat and Gears Bike and Ski Shop, who asked me about my location. I described the clearing with a potential of 3 different trail options that were not real clear on the outdated map. They knew and directed me to the right trail and as I made my way to town for something to eat, I bought a new map from the shop right before they closed for the night. They laughed at my old map and said, no wonder I was lost. Most of the trails are not featured on the old map. My wife does not like me to ride by myself but if I am careful and have the right amount of food,water and the current version of the trail maps, I am pretty self sufficient these days. Most of the areas I ride are popular and you see a lot of people. 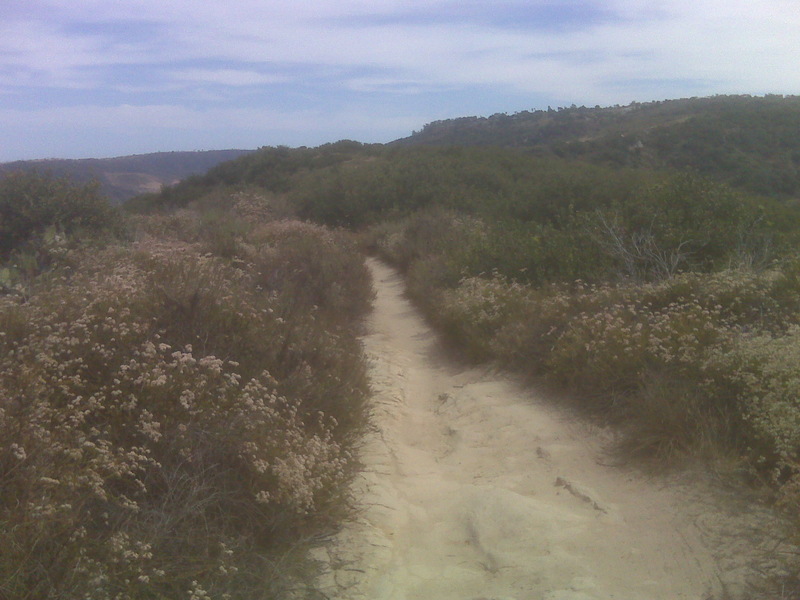 But some are more remote like the Laguna Wilderness Trail System that I rode a lot back in the day. 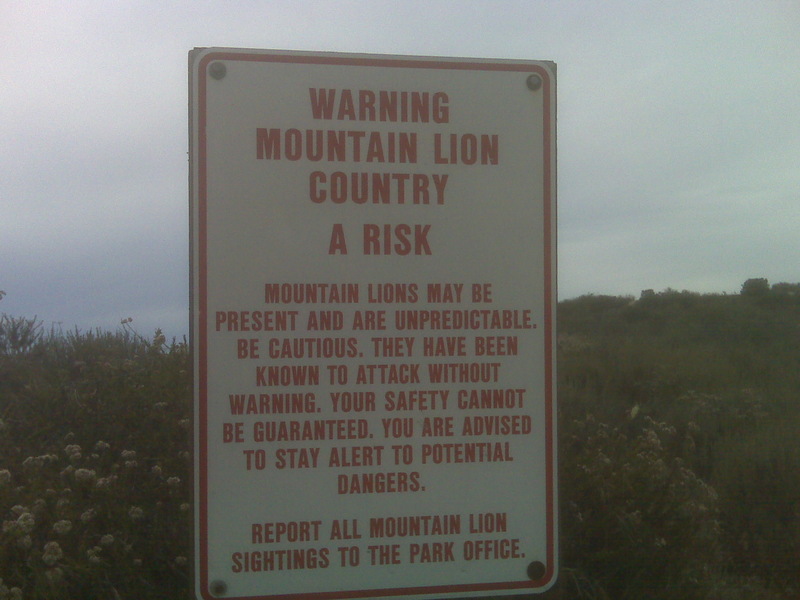 I had a good map for those rides but the signs warning about mountain lions was a bit concerning. Never saw one. Only the big blue Pacific Ocean. But without the map, you can get DFL on those trails very easily. And they get fairly remote quickly with the threat of the big cats and rattlesnakes. Bottom line, good idea to always ride with a partner or on trails that are familiar and have bail out points. Secondly, a good map or better yet, a GPS that you can count on. I have to get one and get into the 21st century. But in the mean time, my maps are up to date and hopefully I will read them correctly and not cause my wife heartburn. Ride safely my friends and thanks for reading. So all of us were back from our western ski adventures, and once again at our home resort for what was probably the last weekend of the season. The sun was out and the snow was soft and the crowds were gone. 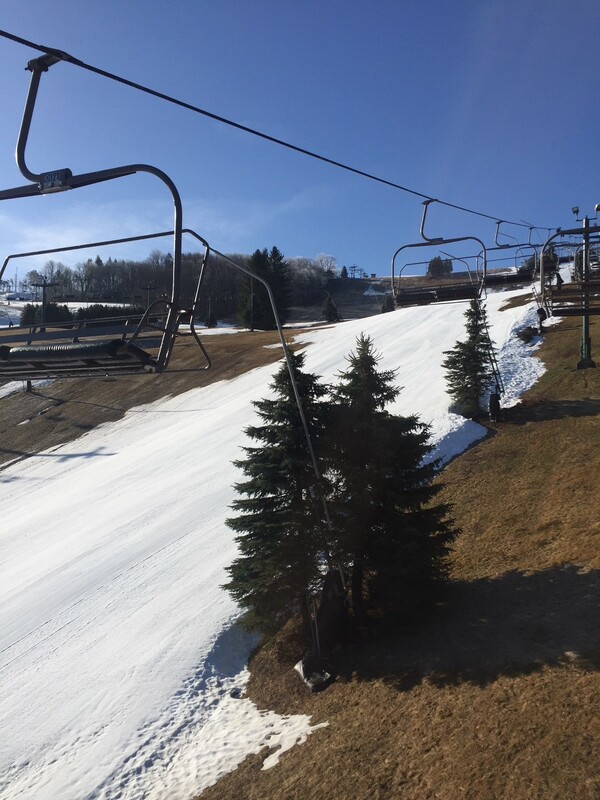 Most people at this time of year around here are itching to get out on the golf course or ride their bikes, and skiing takes a back seat for the spring. But some of the nicest snow conditions are in the spring and if you don’t want to hit golf balls and have them plug on every shot or ride mountain bikes in amazingly wet and muddy conditions, you can enjoy the last turns of the season. I did and with this group of dedicated skiers, we bid farewell to the 2017-2018 season. I already purchased my Highlands Pass for local skiing next year and also my Epic Pass renewal for the trips westward. You see, I get a little depressed with the last turns of the season because it will be another 8 months until I am on snow again and I am not getting any younger. Although, I am inspired by Stan Friedberg’s Guiness Book of World Records achievement as the oldest heli-skier in the world. At 91, Stan can still turn em and it is an inspiration to all of us. Gives me a lot of hope for many more seasons. Every year takes some effort to get the ski days in. 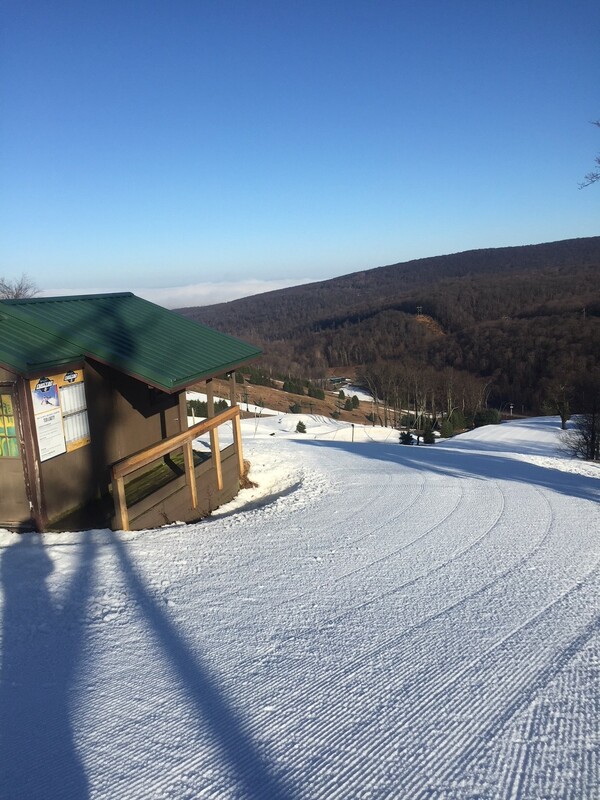 We all start off with the first reports of the opening at Seven Springs, our local mainstay area, and we all clamor to make turns early on one slope and a couple of trails as snow making and cold weather allows. Then we look northward to the Lake Erie storms and make our way to Western New York to take in some of that early season fluff. 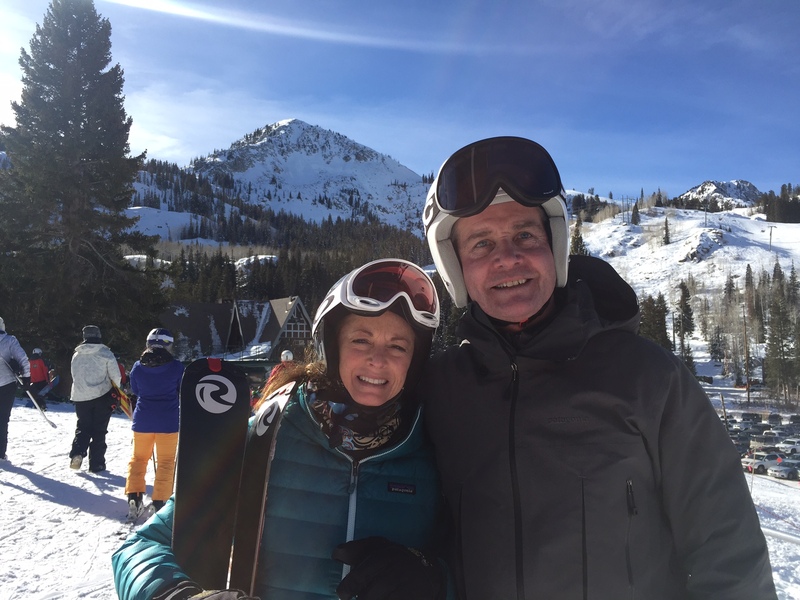 Then for Janet and me, we made our way to Utah to ski with Mike and Judy Smith and their daughter Shayna and husband Nick for a couples trip that included a harrowing “thin cover” run that rattled Janet. She composed herself and skied well for the rest of the trip but was a little unhappy with me for taking her to “no man’s land” with thin cover in Utah. Funny thing about skiing is that until you get to the mountain, it is a royal pain hauling all the gear like a sherpa, getting to and from the airport, and fighting the crowds on holiday weeks. Then you have weather. 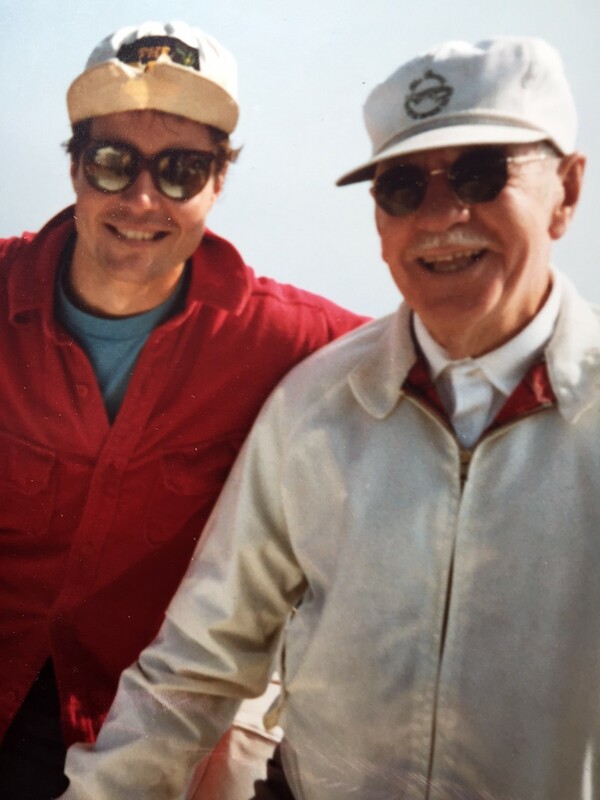 Like when I made my way to the Adirondacks to ski with my pal Mike Smith- the other Mike Smith. . Along with meeting my friend from Vermont, Mark Hutchinson, I braved probably two of the worst snowstorms I have ever driven in on the New York State Thruway. But the turns and days with those guys at Whiteface and Gore were worth every minute of white knuckled panic. I also ran a traffic light in Amsterdam, NY which got me pulled over by a State Police officer. However, after a nice chat between two guys alone in a snowstorm and my contrite explanation of why I ran the red light, he cut me a break and told me to get back on the Thruway and don’t try to take the short cut. Moving forward, got up early most Saturday mornings to meet at Laurel Mountain with my group there and had some fantastic days until the 78 degree thaw and biblical rains forced an early shut down of Laurel. 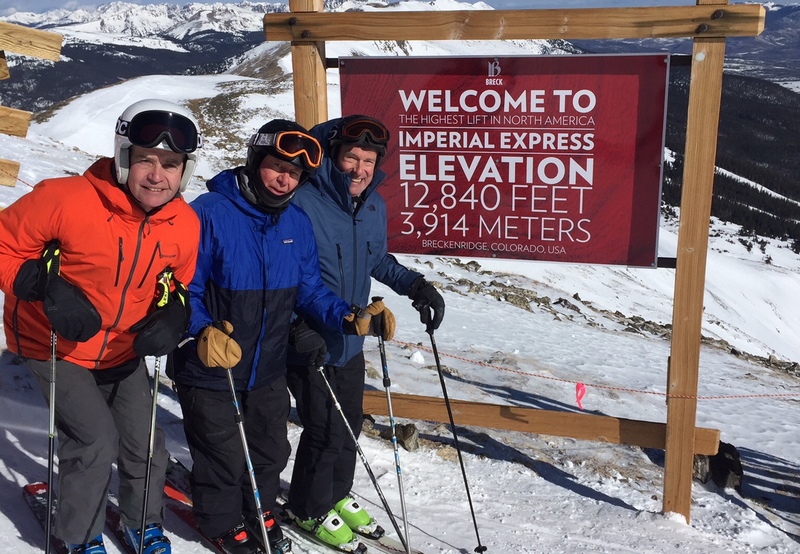 Perseverance was the call after slicing my tendon in my knuckle and making my way to the annual guys trip – this time in Colorado. Dr. J and the physical therapy team were cautious about my trip so early after the injury but after returning with 320,000 vertical under our belts, he was relieved that I came back with no injury to the healing tendon. 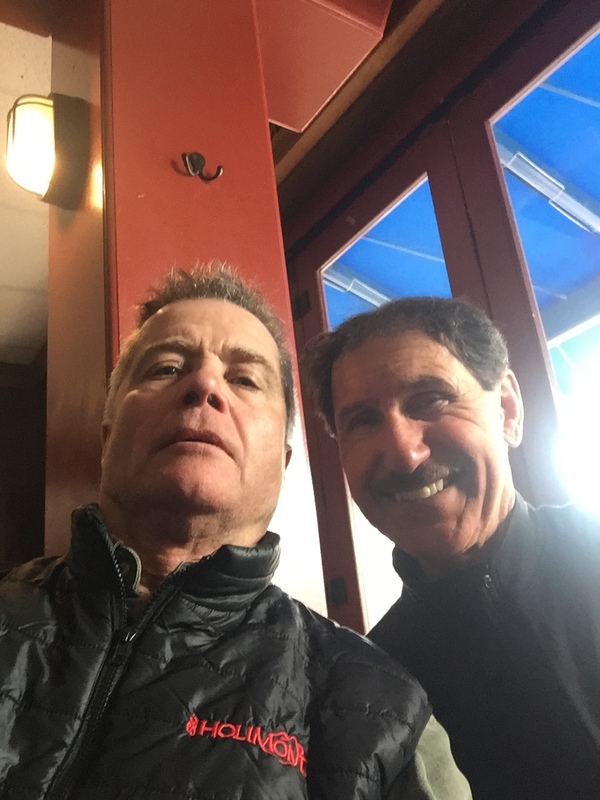 Got to ski with my buddy the singing ski instructor from Vail- Art Bonavoglia listening to his tunes on the chairlift. 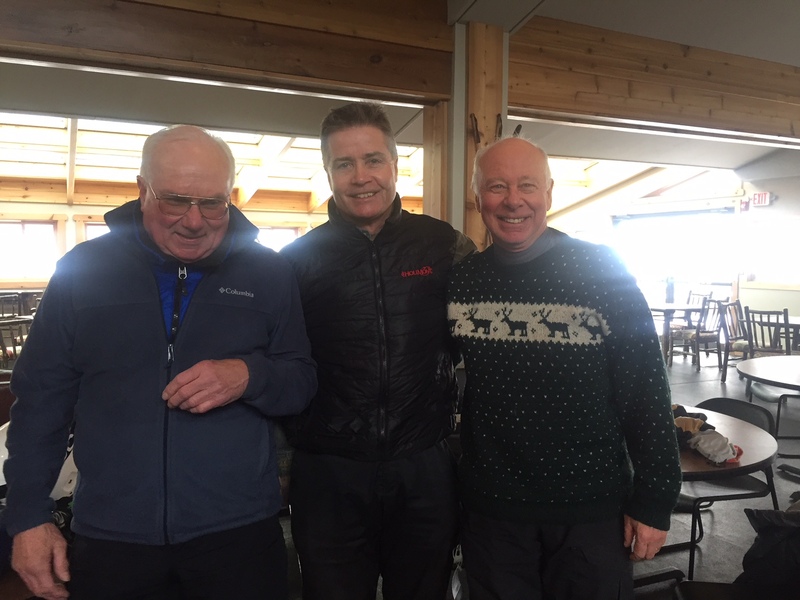 Always a pleasure to ski with my old pal Art who is really skiing well. Also, got pulled over again in Idaho Springs, Colorado by the local police officer who said I was speeding in the 25 MPH zone. Most people think this is hilarious because I am the most cautious driver they know. A speeding ticket? McCloskey? But again, the police officer was from Pennsylvania and we had a nice chat about the Super Bowl Champion Philadelphia Eagles. He asked me if I was a Steeler fan and I said, ” What is the right answer?” He said he was from Harrisburg and I congratulated him on the Eagle victory. He let me go like the officer in New York. 2/2 in potential citation stops. Someone is looking over me. Finally full circle back at the Springs with the group that you see above. 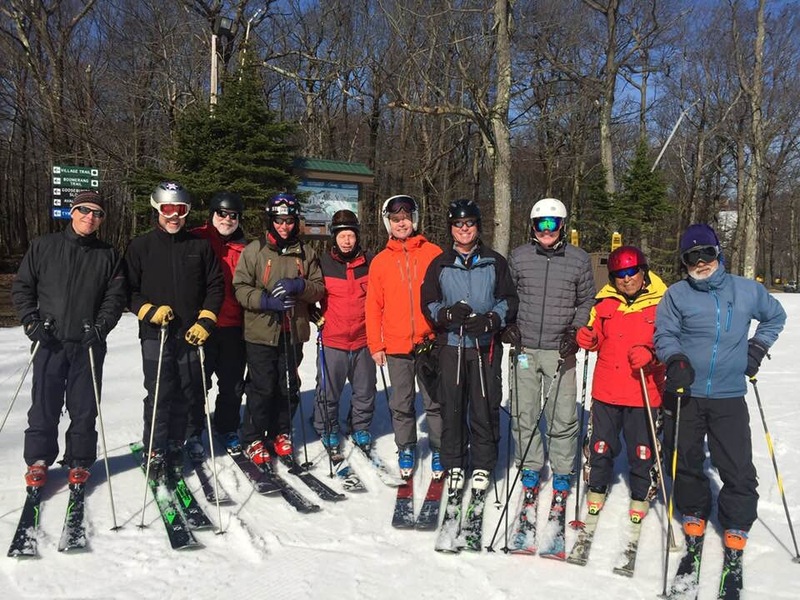 It takes some dedication to ski locally and to make the time and effort for ski ventures out of state but this group does it and looks forward to every season. 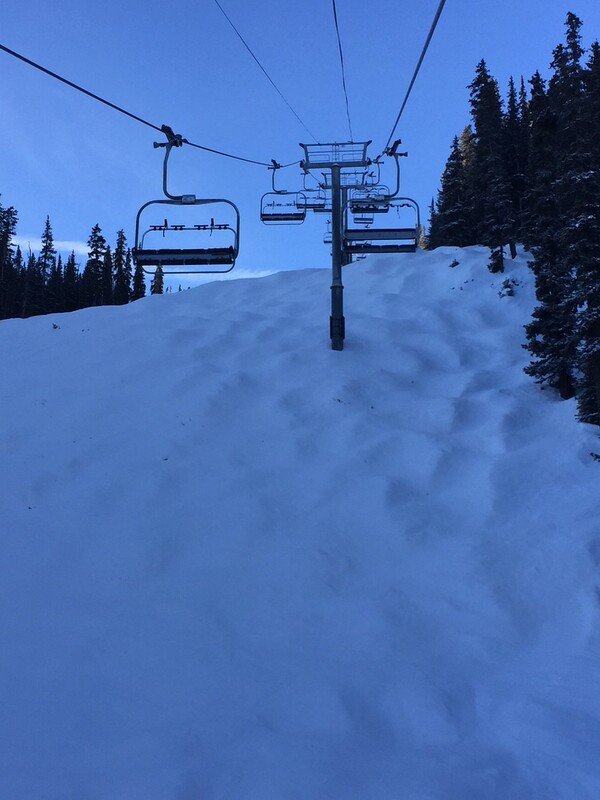 So, as I made my last turns for the 2017-2018 circle of ski life, I was a bit forlorn. But looking back, it was a good season and now I switch gears to spring and summer activities, patiently waiting for the cool weather of the fall, the turning leaves, and the first flakes of 2018-2019. Thanks for reading. You have to give credit to die hard skiers who are willing to get up at 4:00 AM or earlier to beat the traffic on a Saturday morning on I-70 West to get to their favorite ski area. Not really a problem during the week but as our group noticed the line of traffic coming up the mountain on Saturday, we admired the grit and determination of Colorado skiers to get their vertical. Not everyone has the opportunity to rent or own a place in the mountains and those who make the trek on Saturday morning instead of Friday night are to be admired. 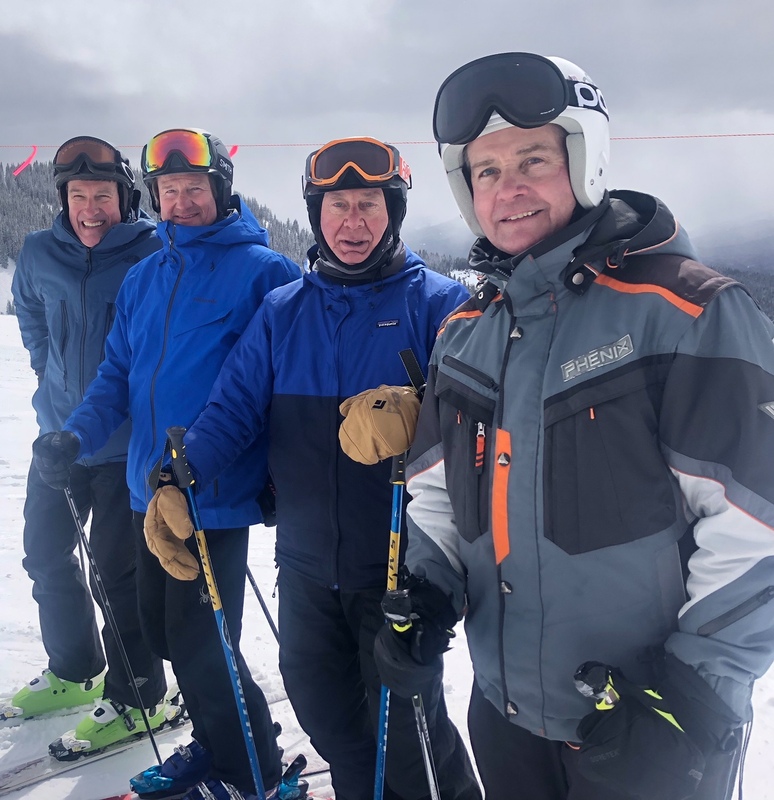 After skiing for 7 days at all the EPIC areas, our group of 60+ age group guys were closing in on 300,000 vertical feet. Now to be clear, one guy raced for Dartmouth, one for Cornell, and one was the ski coach at Stowe for many years. These guys can ski for sure but Saturday morning there was a different feel to the trip seeing the new fluff of several inches in Silverthorne with the prospect of more at the top of the Continental Divide. As we put the rental truck in 4 wheel drive, we made our way up past Keystone and viewed people who were camping and starting their back country adventures along the road. 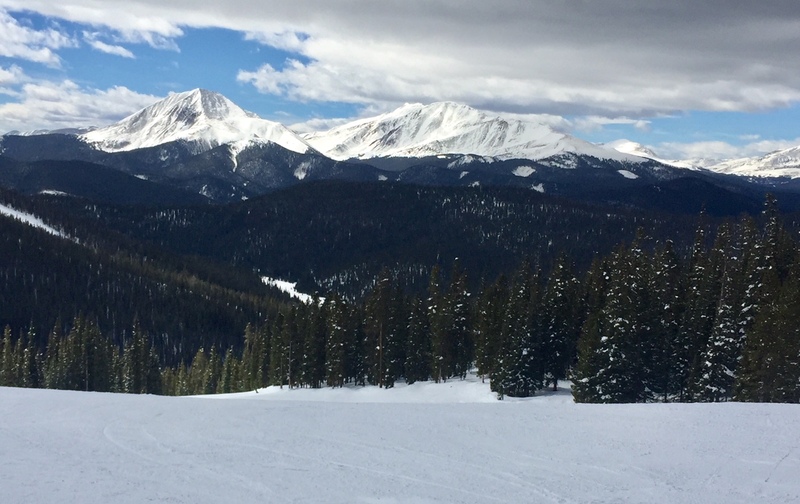 Many of the staunch outdoor people of Colorado avoid the cost of a pass or lift ticket and enjoy paying for their own vertical with their own sweat and physical climbing effort. These are not the types who looked down on us while we were clomping in our ski boots at Beaver Creek after getting off the bus from the parking lot below. ( They didn’t look down on us on the slopes though- that is our domain). Working our way early to the parking lot, we were guided to a perfect place up front of a quickly filling lot next to” The Beach” where folks set up their tail gate parties ready for a sunny day in the Rockies on their day off. Our fearless leader had us up early to beat all the traffic and as we rode the first chair of the day, we were inspired by the grooming and the beauty of the morning. But what we did notice was that there was a spirit of comaraderie among the faithful that made the effort to get a close parking spot, and get on the lift as soon as it opened. Lots of “whoops” and ” yee haas” as the sunny day began. No frills at the lodge but what looked like a great skillet breakfast if you wanted to partake. Also lots of cool historical pictures adorning the walls. 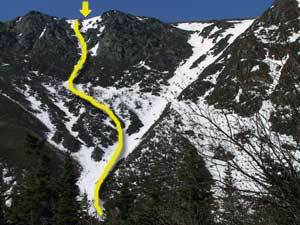 As we viewed the East Wall, we noticed tracks again of those who delighted in climbing for their vertical within the bounds of the ski area. We had a general tour of the area which provided a different skiing experience than we had all week. Yes there were some thin spots due to the seasonal lack of really deep snow but we successfully avoided core shots to our finely tuned skis. We are a little particular as to the tuning and waxing of our boards but most of the faithful up on top of the Continental Divide that day had no such concern. They made it here and they were going to enjoy every minute of it. Core shots to the bottom of the skis be damned. Towards the end of the day, folks started to crank up the grills, pop the beers on the Beach and pull out lawn chairs in the parking lot. It was a festival atmosphere celebrating all that is good about skiing and making the effort to get to the mountains. These Colorado people work hard during the week and listening to their stories about how they got here from parts all over the country, you get the feeling that they came to ski. They work to ski. This was a priority in their relocation. The natives are just as zealous but they have a laid back attitude that is ….well….native I suppose. Most of the areas on the EPIC Pass are resorts. There are a lot of tourists and folks who come to be seen. But up there on the top of the divide, there are no pretentious attitudes. Live and let live and ski to die are the mottos of the day. There are no condos, Starbucks, fur coats and boots, luxury restaurants and faux Alpine base villages. (Not that there is anything wrong with that- PC Pat!) 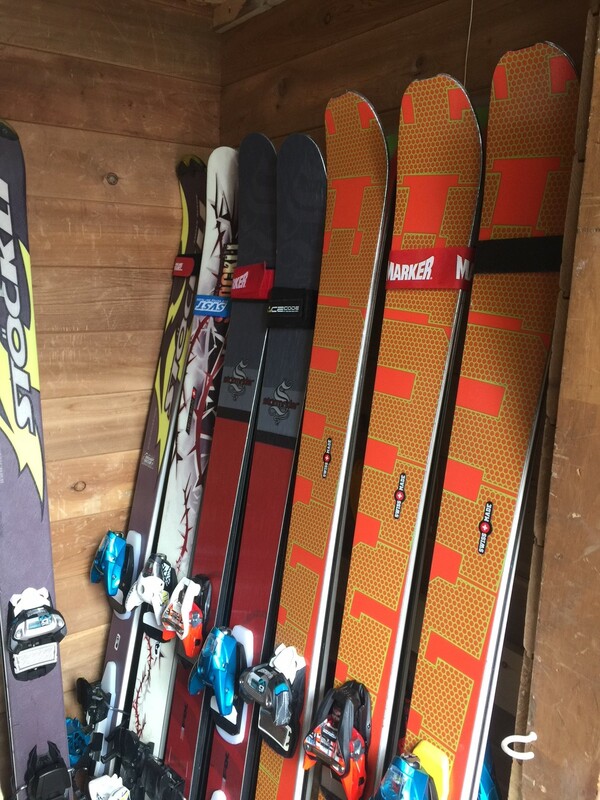 Here is great skiing and basic needs. As we shamelessly changed our clothes at the end of the day and drank a beer in the sunny parking lot, we felt part of a larger group of fun seekers who week in and week out, seek the magic of the Rockies and the communal welcome of good turns on challenging terrain. As we made our way out of the pass at the end of the day, I felt a content, ” these are my people” feeling and reveled in the majestic views at the top of Loveland Pass. 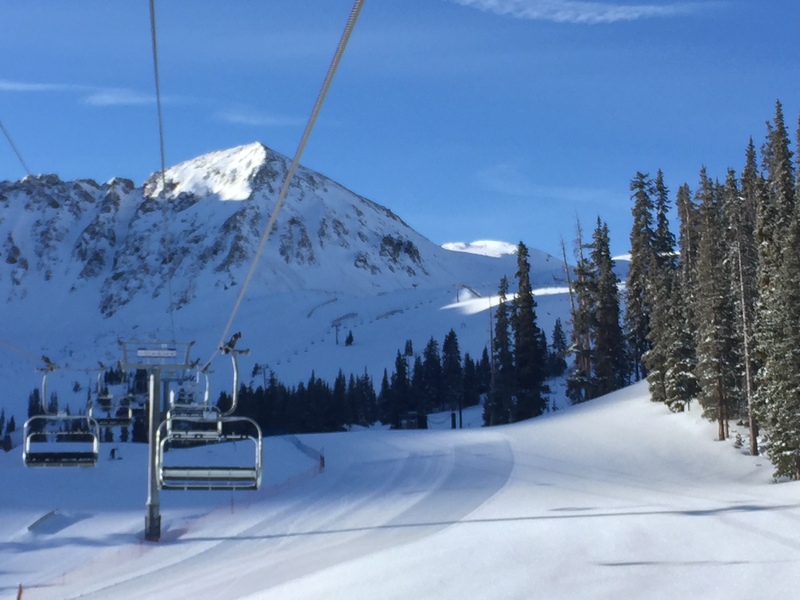 Folks- if you want the real spirit of skiing, go to Arapahoe Basin or A-Basin as it is described by the Colorado faithful. For me, a much better experience than most ski areas. Squeezing out every last flake of snow this season, I thank you for reading. One of the aberrations of any athletic activity is if you think your coiffe will look good after a sweaty ride under a bike helmet or a perspiring day under a ski helmet or wool hat, you are mistaken. Hat hair, helmet head, or any other number of adjectives to describe the plastered, greasy, sweat infested hairdo at the end of the day is something that needs attention. Now there are those who refuse to wear a wool hat or a helmet during the most ferocious storms and cold weather in the winter only to hope that the windblown look will survive and look attractive in the bar at the end of the day. 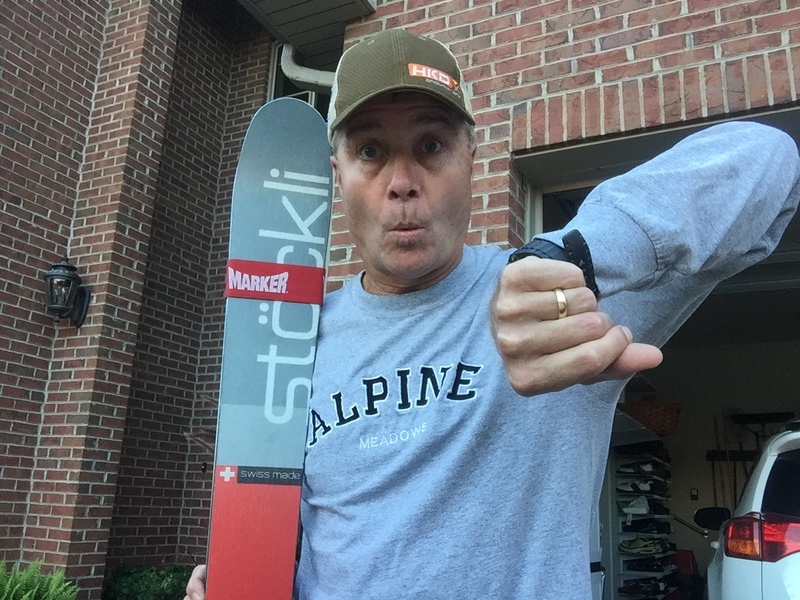 Some folks fall prey to this mistake by wearing a wool ski band in zero degree weather so that they can mimic the spring skiing models in Ski Magazine. Not something to do in mid winter conditions. But the rest of us who value our warmth and safety, wear the wool and the helmets and suffer the nerd like look of the plastered head at the end of the day. Enter the trucker hat. Now with a noggin like mine, I need XL hats- period. Take the oversized, wide brimmed versions made by Big Truck Hats out of Squaw Valley, California. http://www.bigtruck.com I have several of these hats because they fit my melon real well and don’t look like most hats that fit like a yarmulke. These large trucker hats come down close to your ears and have a wide brim that not only covers the aforementioned head grease real well, but they are stylish. 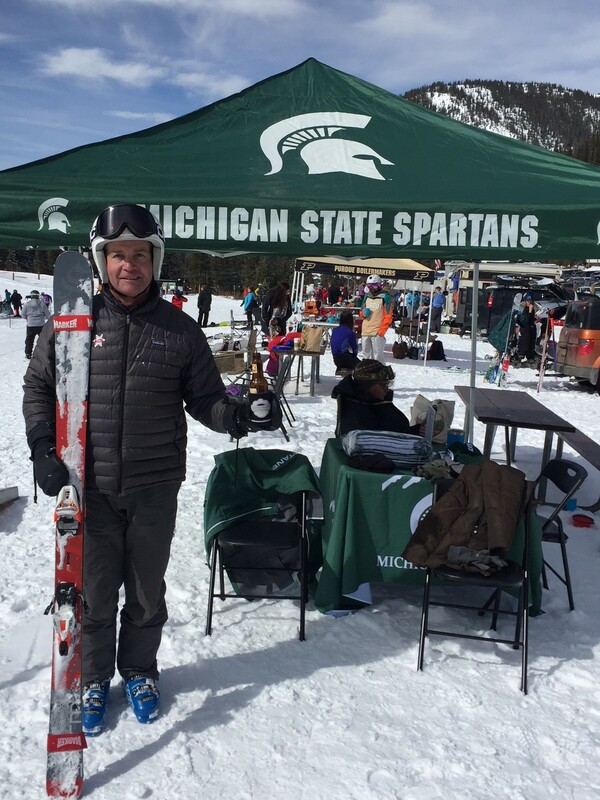 A great addition to one’s attire on the deck of a ski area after a great day on the slopes. Great for women and men alike and with a good pair of Ray Bans, you are ready for anything that is offered at the after ski party. Now if you didn’t cover up that goop, you would look rather disheveled and that could last into dinner which would further the disgust factor. The trucker hat is approved for after ski dinners and no one would think any less of you for wearing a hat at dinner especially if they saw the matted horror that lies beneath the stylish lid. Showers are not always timely and the covering is essential. 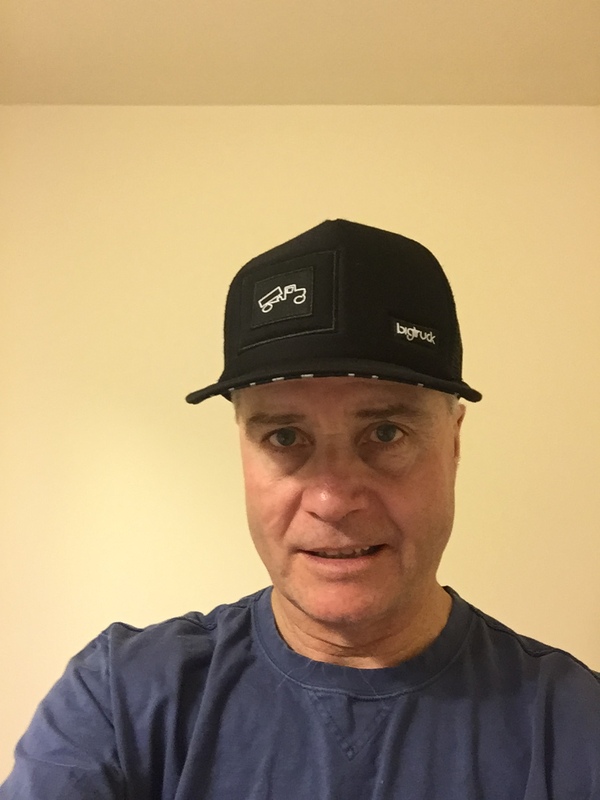 Summer is coming and like my matted sweaty head seen above with 3 time Tour de France champion Greg Lemond, it was immediately time for a shower or a quick visit to the duffel bag for a Big Truck hat. 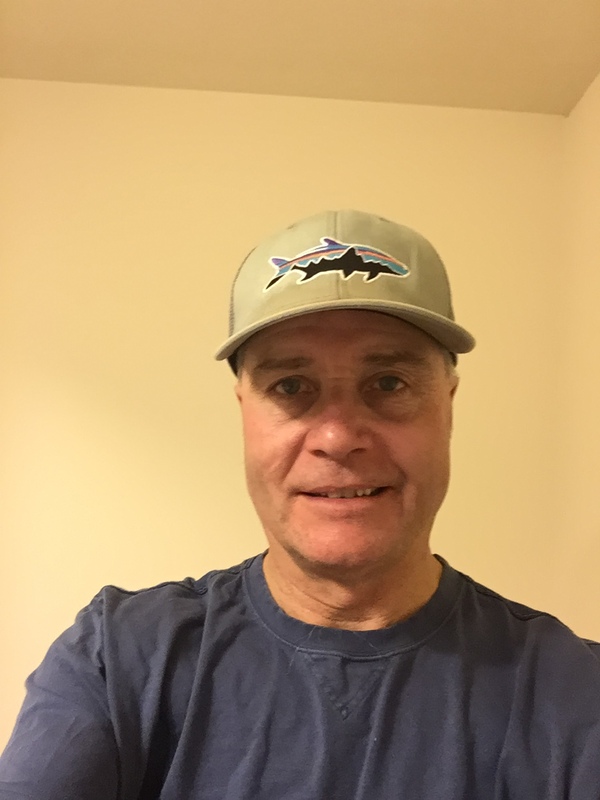 There are others that fit the bill in my collection which include the HKD Snowmaker hat, the various ski area hats that I wear, and the sweat stained favorite Tarpon hat from Patagonia. Hat hair has definitely taken a toll on that lid after rides but it is a badge of honor if I can get by the initial smell factor. A sweat stained trucker hat is high on the approval rating for any weekend warrior. You may also be interested in knowing that hat hair is in our history as well. 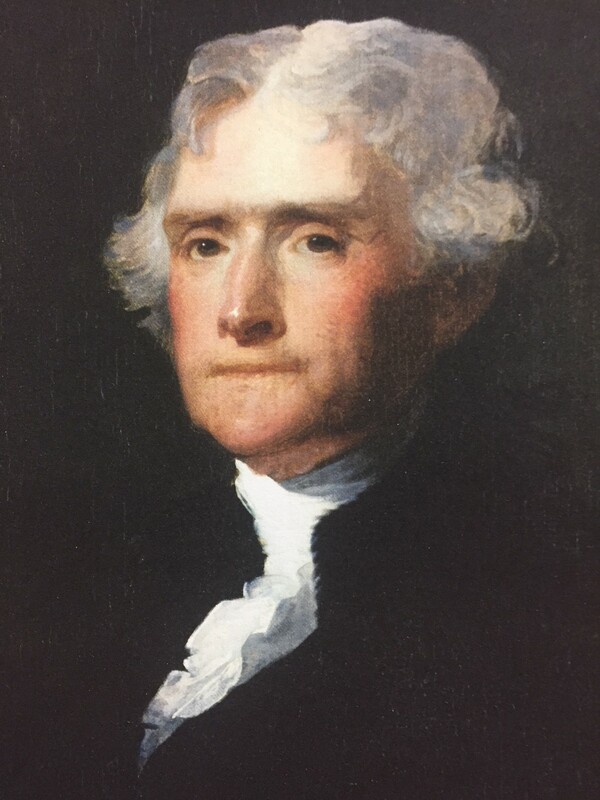 Take Thomas Jefferson here with a bad case of hat hair after apparently removing his tri- cornered hat to pose for this photo. 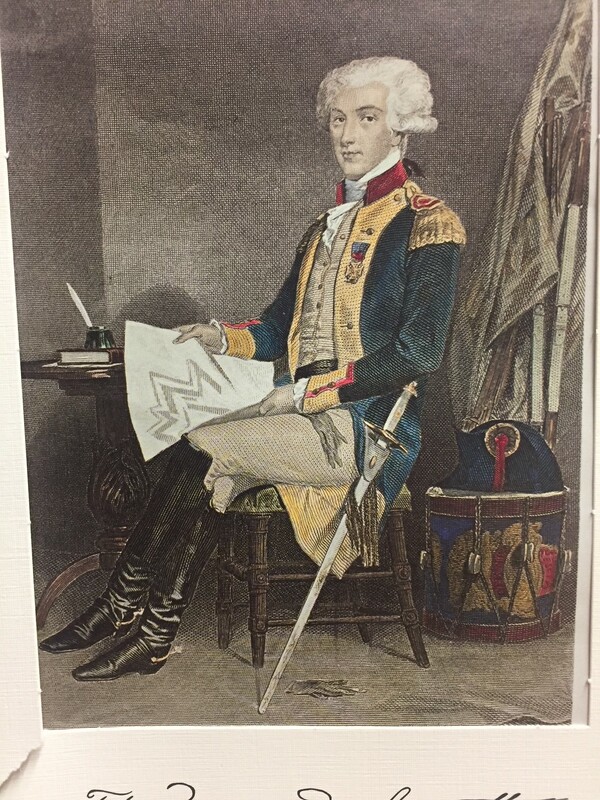 Or perhaps the Marquis De Lafayette- our friend who helped wrap up the Revolution? His bouffant was altered by the tri cornered hat as well. Imagine if they had Big Truck hats back in their day? Quite stylish for apres activities at the Monticello or on the continent. So when you are selecting hats for covering the helmet or hat hair, remember to be honest with yourself and take in consideration the size of your head. Most golf course hats, baseball team hats, and others with the adjustable cloth band are no where near large enough to proudly wear. They are just too small and come down only remotely close to the benchmark top of your ear. But the snap back trucker hats can typically be easily fitted to a large cranium and come down close to that benchmark. Nothing else is acceptable. Spend the money on a Big Truck hat or get one similar at your favorite ski area, bike shop, or resort and you will find that it will become part of your standard post ski/ride attire. Do your fellow skiers and riders a favor. We don’t want to look at hat hair. Thanks for reading. 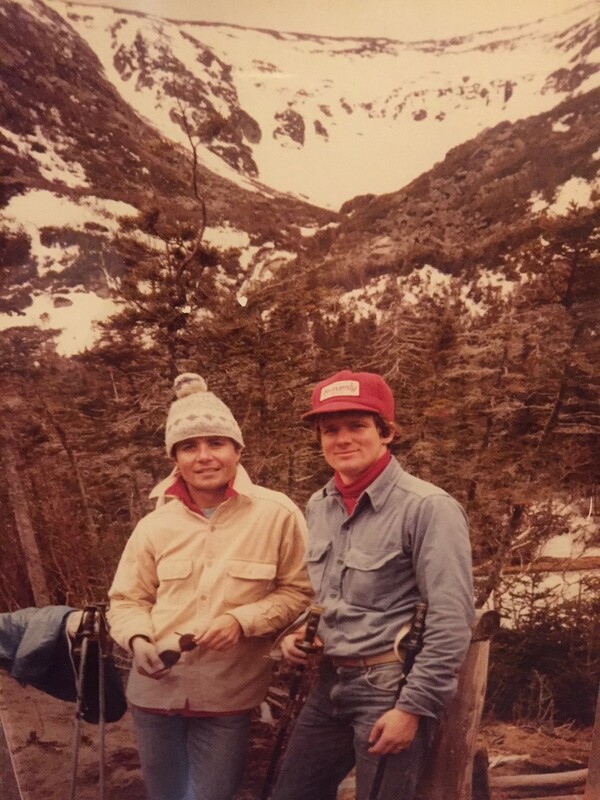 This is a picture of my friend Eric Durfee and me back in the day at Tuckerman Ravine. 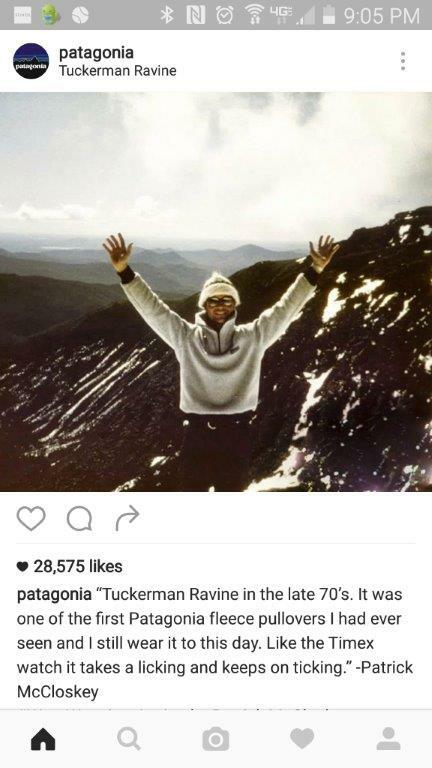 We used to ski and camp there a lot and although there was enough adventure for the both of us up there with changing conditions and falling ice chunks the size of Volkswagens, we never had an injury while skiing there. Back home after one of those epic trips, I was walking by the tennis courts in our county park, stepped on a tennis ball and broke my foot. People asked me,” Pat – did you do that on your ski trip?” I responded in the negative and told the rather boring tale of the tennis ball. You see,most injuries I have ever had in my life have been mundane, boring circumstances which is how most people get hurt anyhow. Not paying attention, in a hurry and things happen. 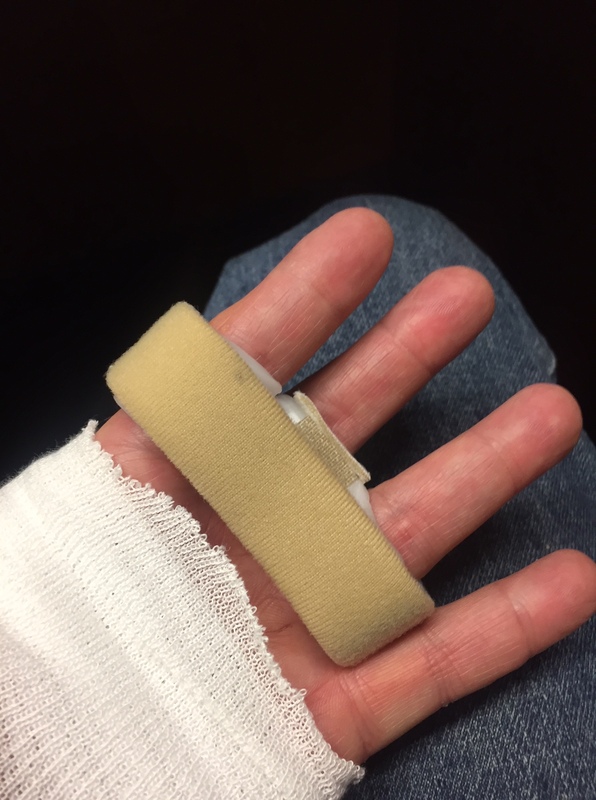 Interestingly my friend Eric and I were talking the other day about my recent severed tendon in my hand which was done in a hurry shoving my bike in my Jeep. We recounted our past tales of injuries. 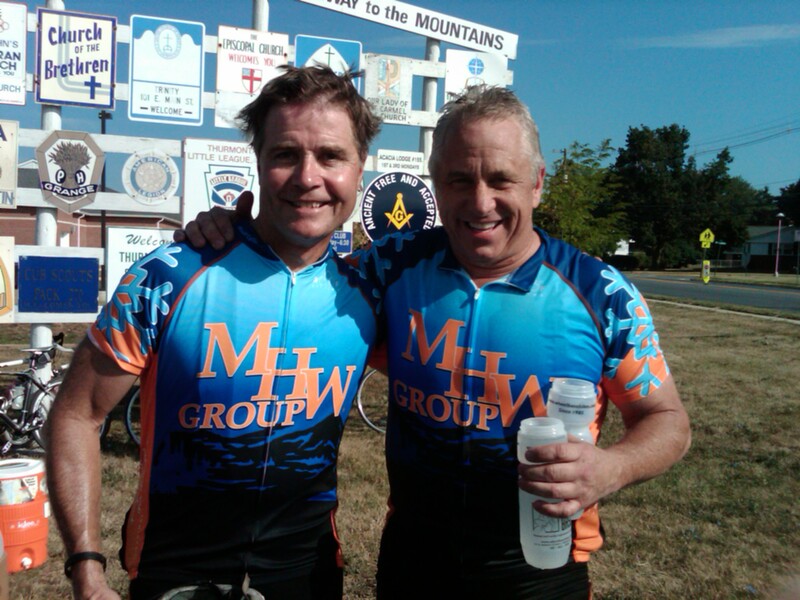 Like when Eric rode the Tour of Cayuga Lake 90 mile road bicycle race with a cast on his hand fitted to the bike handlebars. 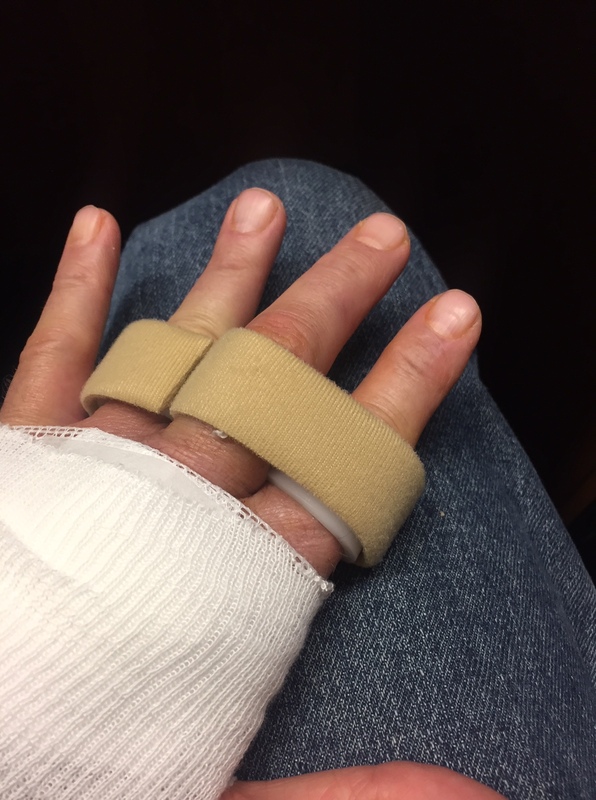 I chimed in with my similar tale of skiing with a wrist cast molded to fit my ski pole. I finished a Utah trip skiing like that. I also told him about my time when I skied for 6 weeks in the winter on my left ski only. I broke a bone in my right foot and fitted the cast into a moon boot with a lot of padding. Skied most of that winter on my left ski which in the long run was good for my skiing. It made my right turns as strong as my left turns when I returned to skiing with both skis. 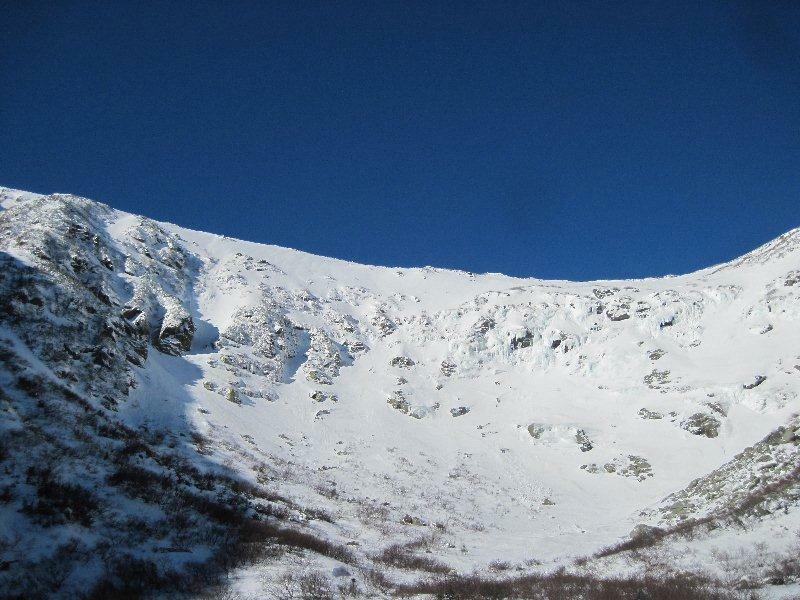 But my friend Eric takes the cake though when he reminded me of the time we skied Dodge’s Drop up at Tuckerman Ravine. We did not obey his old ski coaches edict(Joel Bostick from Cornell), which stated that you should never ski anything in Tuckerman without climbing up first to have a look. It was a foggy, dreary day and we found ourselves at the top of Dodge’s and decided to go for it even though we had not seen what it looked like from the bottom. We got about a third of the way down when we came upon a frozen waterfall. The dilemma was before us as to how to navigate this. I basically put my skis horizontal to the slope and slid down the waterfall sideways on my rear end- or right cheek basically, until I reached the snow again. A shaky move but I pulled it off. Eric had the more heroic move by placing his tips and tails between two rocks, balancing himself, and then jumping straight up into the air,turning downhill, and straight-lining until he reached a comfortable spot on the snow. The amazing thing is that he did all of this with a fiberglass wrist cast. Two skis, one pole. As we sat at HOJOs having a beer later in the day, on the deck, we saw that our tracks were the only tracks in Dodge’s that day and the deck conversation with some guys was focused on ” those two guys” who skied Dodge’s that day with the frozen waterfall and all. We smiled as we drank our beer. I guess one would either call this behavior of ours foolhardy or fanatical. But either way, I am doing it again next week when I head to Colorado with Eric and our other guys from our annual trip together. Dr.J sewed me back together and I am in the fast rehabilitation mode. The rehab folks made me a small spint which I will wear under a mitten fashioned so that I can hold a ski pole and all will be well in my mind. Jackie, Anita and Lisa,my rehab therapists, don’t quite agree and said I better be careful. They said it usually takes a little more time for the tendon to repair.They are very professional and care for their patients at the UPMC Lemieux Sports Center, but they have not come into contact with a nut job like me before. Wait- what am I saying? They repair hockey players for crying out loud! Once again, I will be playing hurt but do you know what? I will be playing. I can’t thank Dr. Jamie enough and his UPMC staff for the great repair job. I have had a good season so far, injury free, but this little blip on the radar screen will make it interesting on my last turns of the season. Eric and I are used to playing hurt. He in particular with shoulder injuries, neck injuries, and a host of others in the last 6 years that had him playing – but playing hurt. 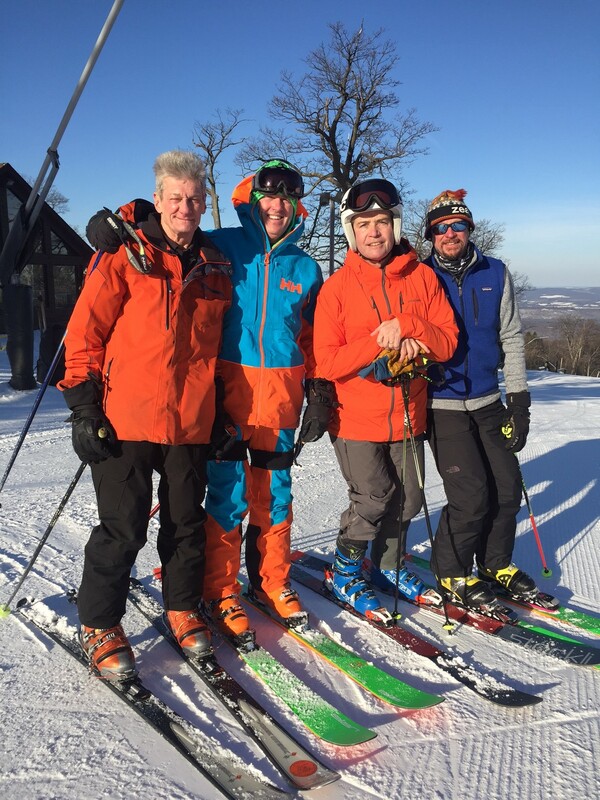 This year he is skiing like he did 30 years ago, injury free and totally healed. He deserves this season for sure and I can’t kick. I have been very fortunate in the injury department. Enjoy the rest of your winter, spring is around the corner. Thanks for reading.